Things You Can do When You’re Dead! by Tricia Robertson is the long awaited book from one of Scotland’s foremost psychical researchers. In this book the author shares some of her thirty-year research into mediumship, reincarnation, psychic healing, apparitions, poltergeists, and after death communications. 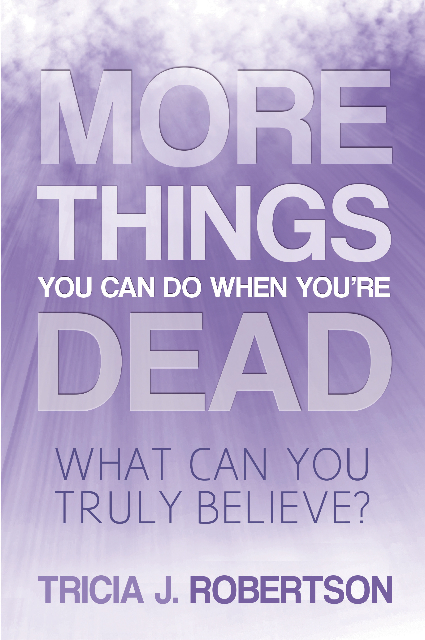 Tricia’s refreshing no-nonsense approach to the subject makes for compelling reading and should interest skeptics, believers, and anyone who wants to know what you can do when you’re dead! Comments on Things You Can do When You’re Dead! Tricia Robertson is one of those rare field researchers who have a way of discovering new cases, investigating them thoroughly, and writing them up in a highly readable way. There is some remarkable material here, and it makes for absorbing reading. --Dr David Hamilton, Author of It’s the Thought that Counts and Is Your Life Mapped Out? An engaging and informative introduction to the topic of post mortem survival. In this book, one of Scotland’s most experienced psychic investigators draws upon her extensive knowledge of cases involving apparitions, poltergeists, mediumship, reincarnation and paranormal healing to present the evidence for survival. What makes this a particularly valuable work is the large number of cases presented, many of which have been investigated by the author personally and never been published before. The informal, chatty style makes the accounts both gripping and easy to read. To Purchase click link: Things You Can do When You're Dead.